So. I went for an interview yesterday. A nice girl by the name of Nel turned out to be also very beautiful. The interview took 10 minutes, and the first thing they asked me to do was NOT to twit, facebook or blog about it until the actual broadcast. That’s it. Sorry, folks! I went to the exhibition of David Hockney’s work at the Royal Academy, and that’s what I am going to twit, facebook and blog about. Heed! We know he loves big. He is also good at small. He’s got the range sorted. When working in a small scale, he still thinks big and finds a way to make a collection of small things into a big issue. Mostly by grid method. Also, sticking to the subject matter and looking at it from different angles, creating a time line, making a performance. In the audio (£3.50 extra), he reveals that his ancestors were agricultural labourers (as if anyone is any different here… Although, some of us might be descendants of aliens and on other planets there may be no agriculture at all…) who followed the pace of seasons, watched the nature. He is thrilled to find himeself following in their footsteps now, albeit in a different capacity. He says, he learned to plan ahead, just like they had to, anticipating the seasons and planning and pacing accordingly. The show displays that spectacularly. The landscapes of the same places at different times of year, dressed up in colours of Spring, Summer, Autumn and Winter and executed in a variety of media and sizes is a triumph of forward thinking. I was most taken by the digital media – iPad pictures and videos. Yesterday, I intended to visit the exhibition, but later changed my mind in favour of going to the Apple store to play with the gadgets and ask questions. The idea was to see if I need any. Well, I soon got bored, because I couldn’t see how to apply them to my create processes. And as there was still time to kill, went to David’s exhibition after all. And he showed me!.. How to paint with an iPad in a most spectacular way! Not the technicalities, of course, but the end result. And that’s all one needs to get inspired and to want to learn more. I think, Apple people should pay him for brilliant marketing job. I personally am buying an Ipad! I would also like to buy several video cameras, 18 huge flat screens, computers to process it all, a team of technicians to do the filming and editing and a dance company to throw in as well. Because what he did with all of that is: amazing, beautiful, mesmerising, innovative, spectacular, fascinating (in spite of my dislike of this word), impressive, meditative, fun, logical, playful, and so on… I recommend. And finally, the gift shop. There are books. A number of them. By him and about him, but mostly by. Which indicates that every now and then he swipes aside his doodling and gets down to (a lot of!) researching and writing about the things he thinks about. I think about things. But did I write about them? No. Did I research the subjects in depth? No. The gift whop was my biggest inspiration. One day, I want to have a show which would display the breadth and the depth of my work and my persona, AND at the exit I want to have a gift whop full of stuff, and people would be buying it all like creasy. Like I did buy “Secret Knowledge” by David Hockney and it is brilliant! So, that’s my wish. The exhibition runs at the Royal Academy 21 January – 9 April 2012. You must go. English is no my first language and I really find it difficult to comprehend artists talking about art. Or art critics writing about art. Or artists statements – those are at the top of the chart on the creative abuse use of “vocabulary” words. That’s why I loved this article in HuffingtonPost Art section! So refreshing. “HuffPost Arts: You talk a lot about the role of an artist’s identity in becoming successful. How important do you think identity is in terms of ‘making it in the art world’ and do you consider this when you make your art (Art Thoughtz)? “HuffPost Arts: You spend a lot of time translating art world terminology into real world terminology. Why do you think there is such a divide in the first place? What’s the point? “HuffPost Arts: As someone passionate about both hip-hop and fine art, what can the art world learn from hip-hop culture? Oh, just go and read the whole thing! Found a brilliant article on a… technology blog. But that is a brilliant technology blog! “Facebook has already changed the way we communicate, creating virtual extensions of our real lives. Social networks are a microcosm of users’ social worlds and a continuation of offline behaviors. But that’s just for the regular folk – what about artists? How do artists use Facebook to augment their existing work, discuss ideas related to the work and think about the idea of online community? The article is long and packed. Most intriguing I found an artist Young-Sun Han, whose website is an inspiration in itself. As well as the art, of course! A friend of mine, Lesley Samms, sent me a link at the end of December to apply for the “Show Me The Monet” BBC series on art which I did. And forgot about it. Tomorrow I am going to Shepherds Bush for an interview. After that only a quater of the remaining 150 artists will make it to the final exhibition. Wish me luck! I’ll have to produce a proof of my identity and a proof of my authorship for the artwork I submitted. I thought I’d do the latter in a blog form to save myself lagging stuff around London and also illuminate briefly on my way of working on a mezzotint portrait. It started last Autumn. I was again thinking about a getting a new model on my quest for a remarkable face, and remembered Eve – a pretty girl of about 14-15. I contacted her mom Angela, asking if Eve would be interested to sit for me and if Angela herself wouldn’t mind. “Yes” was the answer and one day after that they came to the gallery. Eve was 15, slim, nearly 6 foot tall and beautiful beyond words. I didn’t expect all this when I was asking and certainly got more than I bargained for. It turned out as well, that Eve has just been signed up by a modelling agency after an unexpected turn of events. We had a couple of sessions in my studio with Eve. I was photographing and drawing. We talked about this and that. And so, at the end I had about 800 photos, a few video clips and several quick sketches. 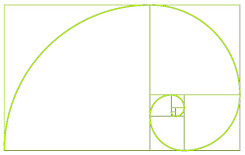 During that time, I re-visited the Golden Ratio and Fibonacci spiral ideas and thought about composition. A few photos emerged as possibilities. Then I photoshopped them into something I wanted the mezzotints look like. Trying them with bands of colour, cropping etc. So, here is the photo of Eve which was the base for the print. What attracted me to this particular one out of the 800 others is the geometry of the lines formed by the hair on the forehead, outline of the face, hand and arm. The face is peaceful, at the same time there is a subtle smile. It hints towards thoughts which cannot be seen, cannot be known, but they are the most important element. They create the dynamics of the whole picture. So, the picture is very static here, but there is motion created by the underlying geometry of the composition and by the subtle expression f the face. Next stage – cropping. I decided to take the Golden Ratio proportions and Fibonacci spiral to base the composition on. Why? To tie together proven classical references and rules (one way or another they run a lot of human programming in terms of how we perceive art) in order to create an iconic image. In a way, I am after something as iconic as Mona Lisa, and some references to that portrait are also incorporated into Eve’s mezzotint. All that laid on the powerful chiaro-scuro effect of the technique itself is bound to create a remarkable image. I ordered two large plates to Martin Maywood. Not long before that we talked and he said he was able to rock much bigger plates now. That’s why I could plan a more ambitious project – size-wise as well as in other ways. 75-46cm plate is quite large for a mezzotint. Got the plates some time in February or March. The next 4-5 months were spent in burnishing. And that’s it. Many hundreds of hours and several stage proofs later I had two beautiful portraits of Eve Delf. Well, also a series of hands with an apple and a trio of smaller plates picturing fragments of Eve’s beautiful face. I can’t see art channel becoming anywhere near as popular as cute kittens and funny accidents, but getting art on Youtube is definitely a must. An article about such plans on New York Times blog. Joining its hometown industry and betting on the success of YouTube’s new initiative to promote original content, the Museum of Contemporary Art in Los Angeles announced that it would start an online video channel in July featuring news and talk-show programming, among other art-focused shows. One thing lead to another, as usual, and I found myself a new beacon, icon, head-figure, an example to learn from – Frank Kern. Beats Will Smith in MiB, Piers Brosnan as James Bond and Johnny Depp as Captain Jack Sparrow any day. Looking for a Yummy Distraction? Through my wandering to” I don’t know where, searching for I don’t know what” I found a great distraction (yet another one!) – GhostWriterDad blog. Actually, I am going through Sean’s free ebook (you can find it on his blog), which is refreshingly different from tons of BS abundant on the Net. Well, I hope to accumulate enough of the information through all those distraction to kick-start me on some grand path of my own. That’s the idea. Meanwhile, it is such a pleasure to read about the struggles and victories of the others!